Xenia Station is home to the largest paved trail hub of its kind in Ohio. The station grounds lie alongside S. Miami Avenue, near Detroit Street (Rt. 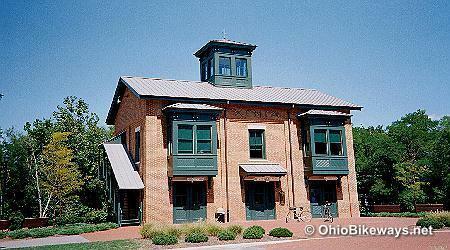 68) in Xenia, Ohio in Greene County. Facilities: Water & restrooms available. Parking: Extensive parking at this trailhead. Worth Noting: The Xenia-Jamestown Connector is a .2-mile road ride from the station off Washington Street. The hub boasts over 200 miles of paved bikeways that connect directly to the station at this time. These trails link to a number of different communities, as well as the nearby Dayton trail network, making this part of southwestern, Ohio very conducive to traveling by trail. Thanks to the cross-state Ohio-to-Erie Trail that passes through the station, more trail miles are being linked with SW Ohio bikeways. When the Ohio-to-Erie is complete, one will be able to ride from Cincinnati through Xenia Station, to Columbus, Akron and onto Cleveland, at Lake Erie. Here are the 5 paved trail sections that converge at or near the station, with their direction of travel away from Xenia. The number of places you can reach by trail from the station is quite impressive. And that number will increase over time as more bikeway connections are made in SW Ohio and along the Ohio-to-Erie Trail route. To help people find there way, an expanding network needs a good navigation system. 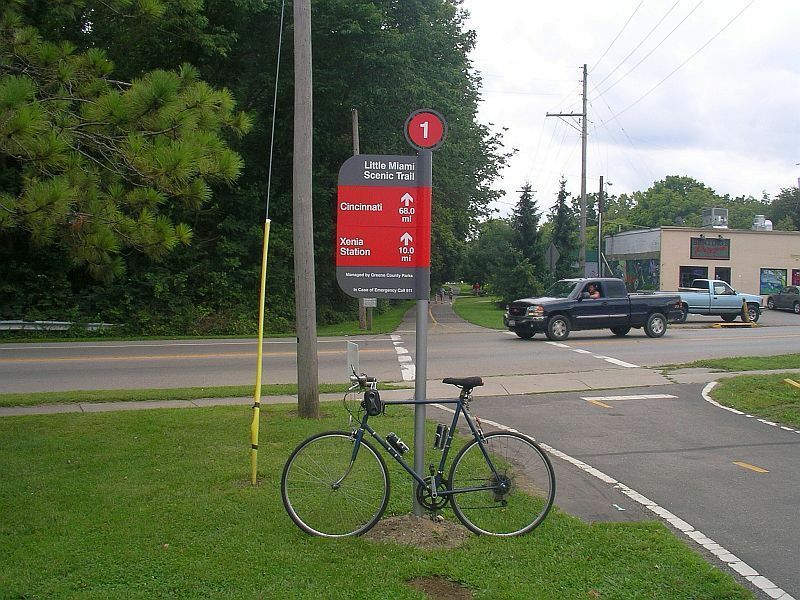 In 2009, the first wayfinding trail signs were installed in SW Ohio, including Xenia Station. The signs feature a more comprehensive navigation approach. They distinguish themselves by using a numbering system for each trail route and listing destinations and the required mileage to reach them. The signs can also list things like: the next town along the trail, nearby facilities, area attractions, etc. For the most part, the SW Ohio numbering system works just fine. 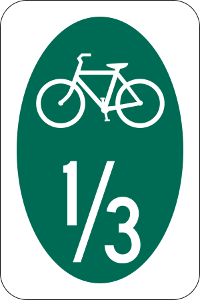 Each trail route gets a designated number. Corresponding maps show the trail network and numbers. That way, all one has to do is find a trail's number, then check a map to see where it's located, how far it spans and where it connects with other trails within the network. Then, during your ride -- provided proper wayfinding signage is available -- you should see signs and numbers that confirm that you are on your chosen course. But there are a couple of glitches that visitors should be aware of in the SW Ohio trail navigation system. Particularly at Xenia Station. So let's take a look. The sign below appears along the Little Miami Trail route between Newtown and Xenia Station. The purpose of this bike route sign is to let trail users know which route(s) they are currently traveling on. Let's pretend for a moment that we know nothing about the SW Ohio trail numbering system. What does the sign above suggest? It tells me that the corridor I'm traveling on accommodates both routes 1 & 3. Or, trails #1 and #3. I check the Miami Valley website (the epicenter for this region) and see that the Ohio-to-Erie Trail is #1 and the Simon Kenton Trail is #3. Ok, so I'm on the OTE route. Am I also on the SKT south of Xenia? Further checking reveals that the SKT starts in Springfield, OH and heads north, so no. I'm not on that route, although the sign seems to suggest otherwise. If you'd like to suggest the Ohio-to-Erie - #1 is already present on the sign, then I have to point out, so is #3. But we know this is not route 3. So now we've gone full circle trying to figure out a very simple thing -- what route(s) is this? The goal for any bike route or roadway, is to have signs (& corresponding maps) that are simple, concise and clear. That way they are easily understood by all. Obviously, the sign above fails that test. So, if you're going to ride at Xenia Station for the first time, it's helpful to be aware of this glitch in the system. Visitors should also know that the Prairie Grass Trail (at the time of this writing) is no longer being recognized on the Miami Valley Trails website. It's not listed among the trail information pages, and it doesn't have its own trail number. Their map shows it as #1, which as already mentioned, is the number for the Ohio-to-Erie Trail route. Otherwise, the rest of the trails in the numbered network seem fine. A State-Wide Trail Numbering System? For the moment, we are not including the SW OH trail numbers on our Ohio Trails map. That's not to suggest that we don't endorse the numbering sytem, we do. However, at this time it is confined to SW Ohio (& the Ohio-to-Erie Trail). So at the moment, it's like a large pilot project. If it continues to be refined and improved, there's a good chance it will be adopted in other parts of the state. But glitches, like those pointed out above, need to be corrected. And wayfinding signage within all parts of the trail network needs to be consistent. And that's not easy to accomplish, considering it requires cooperation from all jurisdictions through which trail corridors pass. Some have suggested that the paved trail network that leads into Xenia Station is among the best in the midwest. And of course there's the claim that it's the nation's largest paved network. Obviously those claims bring riders from far and wide to ride trails at Xenia Station, and rightfully so. To live up to that standard, trail maintenance, good navigation tools and all rest need to be in top form. Thanks to the work of the Friends of the Little Miami Trail group, a major trail in the system that was aging and falling into disrepair is now coming back as strong as ever. And in the future it will take more volunteer groups and collaborative efforts to properly maintain what has become a vast and premiere trail network in SW Ohio.